In collaboration with a leader of the telecommunications, DEK Technologies is working on a innovation project designed to experience the Open Platform for Network Function Virtualization (OPNVF) architecture. DEK Technologies, due to its high skills on the virtual infrastructure management, addresses activities of study, prototyping and verification, with respect to the execution environment of the virtualization infrastructure designed to accommodate the Virtual Network Functions (VNF) owned by the TLC partner. The Open Platform for NFV (OPNFV) is an open source project that supports NFV. As open source project to accelerate the innovation based on a virtualization environment, it supports correlated NFV functions, such as fault management and performance, hardware configuration NFVI and management of virtualized resources that are needed for the NFV infrastructures. 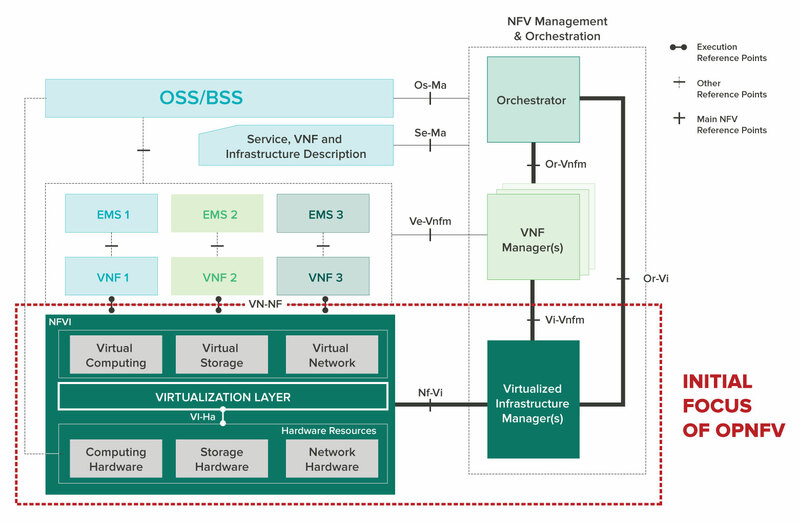 The operators are pushing for the definition of a NFV Open Source platform. The objective is to contribute, starting from the open source projects existing, to the realization of a reference platform for NFV transposing the requirements under definition in ETSI for the realization of “Carrier Grade” NFV functions. The Network Function Virtualization Infrastructure (NFVI) that provides access to basic computing resources, storage and network through the hypervisor. The Virtualization Infrastructure Manager (VIM) that manages the VNFI and provides the management capabilities for the deployment of applications running in a virtual environment, commonly referred to as VNFs. OpenStack is a management system that abstracts the complexity of a heterogeneous data center making it easier for administrators to run large-scale applications on appropriate computing resources. OpenStack and other as CloudStack and VMware are included in the category of the VIM but OpenStack is still the most popular candidate for the VIM because of its “open” nature that allows operators to not bind to a specific vendor such as VMware might be. The task of OpenStack as VIM is to allow, through a management console, to create, activate, migrate, suspend or shut down the VMs, to distribute the workload depending on the availability of resources and to configure the connectivity between applications in relation to the services needs that they implement. The service level enabled by OpenStack is infrastructural, IaaS (Infrastructure as a Service). The operating costs savings resulting from the provided automation represent one of the great benefits promised by NFV.